Q: So what's this "2012 Re-visitation" bit? A: Since we're nearing the end of 2012 and approaching that all-important "year-end-best-of-list-making" season, it's time to revisit some key albums that may have slipped past me and/or were hyped and I purchased but then accidentally ignored and/or didn't ignore but didn't really invest in and if I'm gonna write about music I should probably put the work in. Also, I said I was gonna write more and since I'm always a man of my word at least 40% of the time, it's your lucky day. One-sentence knee-jerk re-visitation reaction on this album: There's a lot to like about Fiona Apple--she just wants to make you work to find it. A little too much. The pros: Uniqueness. Unlike so many female artists/musicians working today, Fiona Apple's vocal signature and preference for variable (sometimes schizophrenically so) time signatures and rhythms means that when you hear her, you KNOW it's HER. Her voice never fails to be raw and authentically passionate while still remaining largely inviting. She oozes sexuality, but seriously so--and largely avoids becoming a caricature. As a straight male listener, I am both turned on and frightened by the sound of her. She could (and probably would) find a way to crush me--and I'd probably let her. Most of the aforementioned qualities are part of the Fiona Apple "package" and like her previous work, they are mostly apparent here. The cons: In a single word--inaccessibility. In most of the reviews I've read praising this album, you see the following sentiment essentially repeated over and over: "Idler Wheel is her most challenging work yet, but that's what makes it so rewarding." And while this is a valid opinion, "challenging" in a music review often translates into "obtuse, inaccessible, or 'I don't get it, so it must be deep as hell!' ". I agree that there is plenty of depth and complex lyrical, melodic, and certainly rhythmic layers here. But there's also an absolute dearth of pop hooks available on Idler. Yes, I want "challenge" as a listener, but I also want something that plants itself in my brain in conjunction with that "challenge". Something that combines clever wordplay and melody. In short, depth does not preclude hooks--a fact that is apparent in large swaths on Tidal and When the Pawn but for whatever reason is largely absent here. The songs are interesting, but not particularly memorable. Stilted, variable percussion, pounding pianos, and metaphors for how angry/detached/impervious Fiona Apple may be can only go so far. They make for challenging songs, but not necessarily songs I feel compelled to revisit. And while the rate of re-visitation (hey, that's the name of this post!) isn't a comprehensive gauge for an album's merit, it certainly counts for quite a bit in my final analysis. Final verdict: The key thing to remember is that there are few artists whose new work I'm more interested hearing upon release more than Fiona Apple's. This is certainly helped by the fact that she goes long periods between records, but her natural talent, acquired skill, and consistent desire to challenge herself and the listener remain the guiding principles behind my evaluation of her. Having said that, she's created an album that isn't as bad as the haters say it is, but is certainly not as great as the larger online music critic community claims it to be. It is BECAUSE I believe she's so talented that I'm willing to call this album what it really is--a well-made, thoughtfully-produced utterly forgettable album. 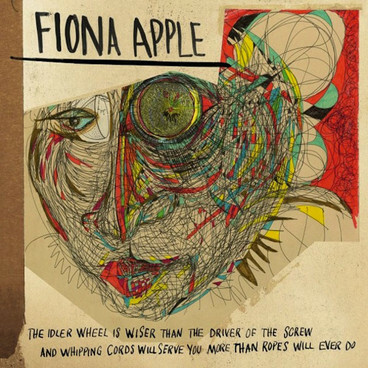 Fiona Apple is at her best when she is transforming pop music with her lyrical, vocal, and compositional brilliance as opposed to completely subverting it--as if creating an album devoid of singles is somehow a virtuous accomplishment much less an artistic objective. Asking the listener to form an emotional attachment to her emotional detachment/angst is one thing. Asking the listener to ultimately do so without a little bit more of the sustainably engaging elements found in her previous work is a much bigger request. For those of you who think I'm unfairly clamoring for "Criminal" or singles in general, I'd argue that Fiona Apple is being sold short much more by you than me. Making artistically-engaging, depth-fueled music that is also occasionally integrated with the right amount of pop sensibility does not necessarily require the sacrifice of one for the other. I know this because Fiona Apple has been so adept at doing this very thing so often in the past. Highlight Tracks: "Valentine", "Werewolf", "Anything We Want"
Low-light Tracks: "Left Alone" "Periphery", "Regret"